Happy Halloween. This haunting photo captures an unconventional commemoration of this day almost 100 years ago. Patients at Hopewell Hospital in North Minneapolis donned masks and witches’ hats, readying themselves for what appears to have been a somber party. Their day would not have been enlivened by any visitors. 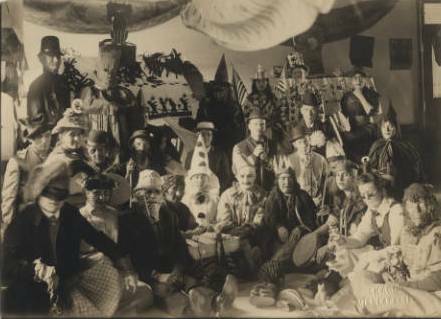 For these unsmiling jesters and grim-looking Indian chiefs, Halloween in 1917 was just another day in quarantine. At the beginning of the twentieth century, Hopewell Hospital was the Minneapolis tuberculosis sanatorium. Situated in an isolated industrial quarter of the Camden neighborhood, the hospital looked out over city workhouse, the garbage “crematorium” and the brick works on the Mississippi River. 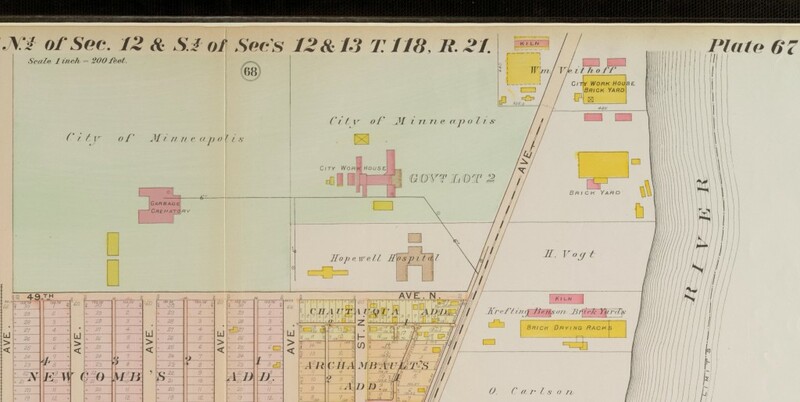 The Minneapolis plat map from 1914 shows Hopewell Hospital and its environs in the Camden neighborhood of North Minneapolis. The TB facility overlooked the “Garbarge Crematorium,” City Workhouse and brick yards. Map comes from the Special Collections of the Hennepin County Libraries. Established in 1907, the facility housed the city’s tuberculosis sufferers, who were seen as an acute threat to the community. A bacterial infection that attacks the lungs and is easily transmitted through air droplets, tuberculosis was a common and deadly killer in these days before life-saving antibiotics. It spread easily in the overcrowded quarters of American urban neighborhoods. Tens of thousands of Minnesotans died from TB in the thirty years before these clowns and witches posed for the camera. Thanks to the recent outbreak of Ebola, Americans are grappling anew with the question of quarantine. Though less common today thanks to widespread vaccinations and highly effective antibiotic treatments, the practice of quarantine was routine when this image was created. In the United States, local governments had imposed quarantines since the eighteenth century. Starting in the late nineteenth century, federal authorities had played an ever-larger role in this process, focusing their efforts on quarantining individuals with tuberculosis, cholera, diptheria, plague and yellow fever. Hopewell housed only TB patients. Minneapolitans with smallpox were brought to another facility located in present-day St. Louis Park, where the survival rate was very low. Hopewell treated TB patients until 1924, when Hennepin County decided to bring all sufferers of this disease under the same roof at Glen Lake Sanatorium in modern-day Eden Prairie. Hopewell Hospital became Parkview Sanatorium and continued service as a public charity hospital until the building was eventually razed. A Halloween photo from the closed ward of a TB sanatorium may be the stuff of nightmares for some viewers. Or inspiration for a new gothic novel by Ransom Riggs set in the post-industrial landscape of the Minneapolis north side. But this image ultimately strikes me as more poignant than terrifying. We have no way to know the real identities of the woman posing as a gypsy fortune teller or the man attired like Uncle Sam. The fates of these patients–and the question of whether they survived their encounters with this deadly bacteria–will remain a mystery. The day after Halloween–known in Mexico as the Day of the Dead–might provide an opportunity to remember this group of Minneapolitans. On Saturday morning we could amble through North Mississippi Regional Park in search of traces of Hopewell hospital, thinking about family and friends no longer with us. And take a moment to reflect on the myriad connections between the living and dead in our city. The photo is from the Hennepin County Medical Center Museum Collection via the Minnesota Digital Library. The detail from the 1914 plat map of Minneapolis is from the Minneapolis Collection at Hennepin County Libraries Special Collections. Special thanks to librarian Ted Hathaway for providing Historyapolis with a high-resolution version of this image. After a summer hiatus, Historyapolis is returning to regular programming. Since it’s map Monday, today we’re featuring a map of “Charities and Social Welfare” in Minneapolis from the Social Welfare History Archives at the University of Minnesota. This diagram maps the provision of private aid to Minneapolitans in the second half of the 1920s, showing the location of 62 private aid organizations. 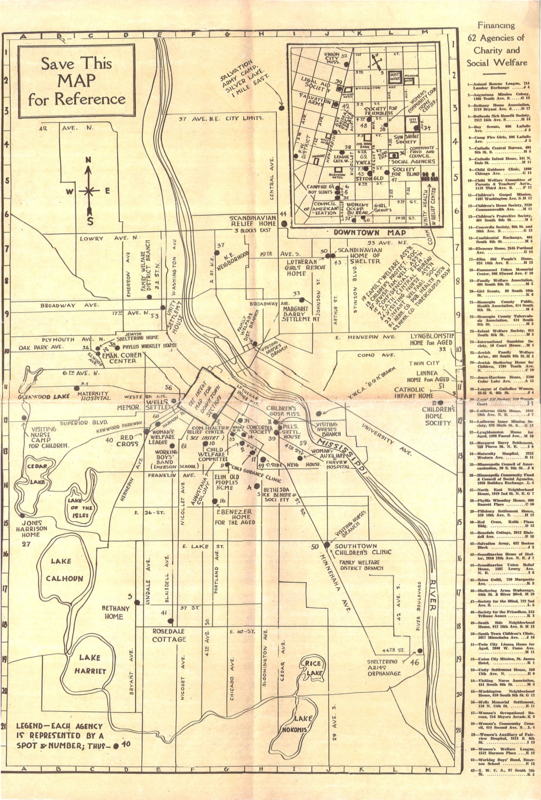 The exact date of this map is unknown, but we know it was created after 1924, when the Phyllis Wheatley House was established and before 1929, when the YWCA moved to a new building on Nicollet Mall. In addition to the Wheatley House and the YWCA, the map includes the Maternity Hospital established by Martha Ripley and the Bethany Home for “fallen women” conceived by Charlotte Van Cleve, Harriet Walker, Euphoria Outlook and Abby Mendenhall. 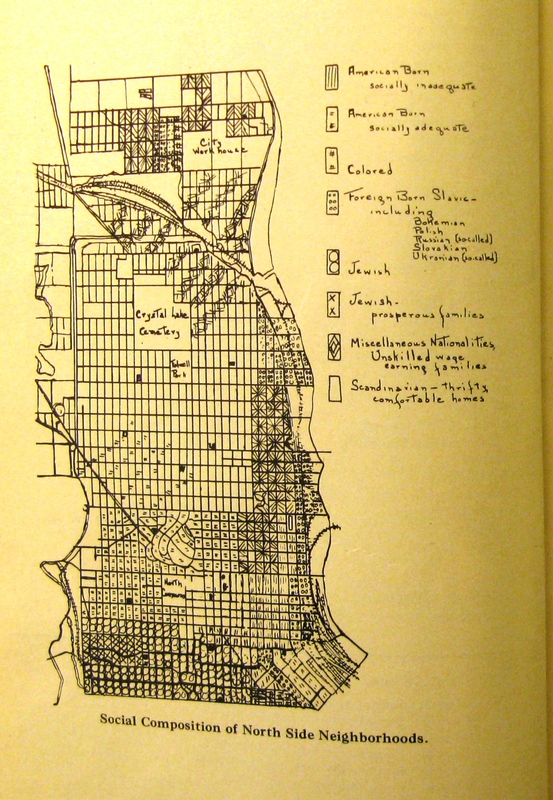 It shows the city’s settlement houses and its public homes for the impoverished elderly. It indicates the locations of orphanages; non-profit employment agencies; homeless shelters and missions; and even the Legal Aid Society, which gave free legal advice to workers embroiled in wage disputes. In the decade before the Great Depression, the city had little in the way of “public” or government-funded charity or welfare programs. Instead, city residents were served by the network of private charitable associations shown here. Between the 1880s and the 1920s–as the population of the city expanded exponentially–concerned Minneapolitans created these myriad organizations to address the hardships created by urbanization, immigration and industrialization. The needs were overwhelming. The city lacked decent affordable housing and had little in the way of sanitation services; children wandered the streets; working people struggled to maintain their health and their employment. These groups–which varied in focus, purpose and philosophy–struggled to make the urban environment more liveable and humane, paying particular attention to the welfare of vulnerable women and children. The organizations shown here were likely linked by a common association with the Community Fund of the Council of Social Agencies, which ran a fund-raising campaign for associated social welfare groups in the city. This map was likely created by this group as a resource for both donors and social workers. Created at the behest of the business community, the Council was animated by the principle of “scientific charity.” Business leaders were instrumental in championing this philosophy, which called on social welfare agencies to work together to prevent duplication of efforts and connect deserving individuals to the services they needed most. This coordination had a darker side as well. Proponents of scientific charity were focused on ensuring that recipients did not lose their will to work and did not game the system, drawing aid from multiple sources. The landscape of private charity was transformed by the onset of the Great Depression, which threw one-third of the city out of work. This crisis overwhelmed private charity, which could not meet the overwhelming needs of the city during that decade. This economic collapse prompted the creation of a series of government welfare programs, which now work hand-in-hand with many of these same groups to address–but never satisfy–the social needs of the community. Image credit: Linnea Anderson, Social Welfare History Archives, University of Minnesota Libraries.